It was always a complex task for American companies to conquer the Japanese gadget market. Other than iPhone models only a few could taste the actual success. So business strategy is the key in this region and Dell has some with their armory. Venue 8 Pro is one their most successful model in US. Dell has foreseen the necessity of bringing the same model to the juicy Japanese market. You always need a convincing local version to perceive it. This time Dell has introduced the Japanese version of their prestigious Venue 8 Pro. And they named it Dell EveryPad Pro. This model has most of the features enabled with the American version and will cost around $485. To grab the hearts of Japanese, Dell made it faster and efficient. Dell EveryPad Pro is also an 8-inch tablet with the IPS display of 1280 x 800 resolutions and possesses HD capacitive touchscreen. The crystal clear display and flawless touch is the significant feature of the Venue Pro 8 and you can expect the same with the upgraded model. Most of the features are similar to the Venue 8 model with a faster processor. 1.5 GHz quad-core Intel Atom Z3775D processor is the main difference instead of the Z3740D used in US model. But the trends are changing and the introduction of Intel’s M core processor has already challenged the older Atom processors and this is now become an important criteria to choose a model. Of course there is no change with the operating system as well. Dell and Windows operating system are longtime partners and Windows 8.1 OS is there as usual. The model comes with a 2 GB RAM and with the 64 GB system storage. Like Venue Pro they have also provided the additional memory storage option of 32 GB.There is no change with the overall dimensions of the new model. The same 216 x 130 x 9 mm is followed here too. They device weights around 405 grams. Another exciting feature is the Trusted Platform Module (TPM) which is a security feature. It is a dedicated microprocessor designed specially to secure hardware by integrating cryptographic keys into devices. This Module is integrated with the Operating system. The device consist of the 5 MP rear camera which is a must feature with the modern day tablets. And also 1.2 MP front camera for professionals and selfie lovers is there. Dell is famous for its build quality and picture perfection and the user can completely count on it. Dell EveryPad Pro also comes with the latest connectivity features like Bluetooth 4.0, Wi-Fi 802.11 b/g/n and 4G support. USB 3.0 feature is not available with the device which they should have been improved. The 4830mAH battery already has good reputation with the Venue 8 Pro model. 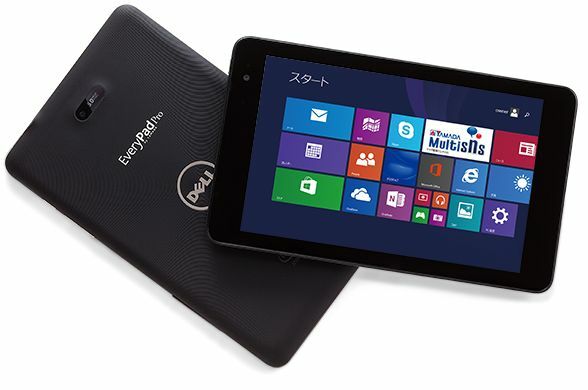 Dell EveryPad Pro has all the capabilities to conquer the Japanese market. The uncertainty of Japanese market is also a mammoth task for the Dell business forecasters.